I’m going to admit something—I’m awful at making smoothies. Whatever I put in my blender, whether its greens, strawberries, or chocolate almond milk, the end result is an unappetizing, watery mess. When 365 Vegan Smoothies came out, I knew author and blogger extraordinaire Kathy Patalsky would fix my problem. Armed with my trusty Vitamix, I tested this book out by picking out a few choice recipes to try out. I fell in love immediately AND became a smoothie master. My husband Brendan used to shy away from my concoctions, but now he was eager to split my smoothie with me. Success! 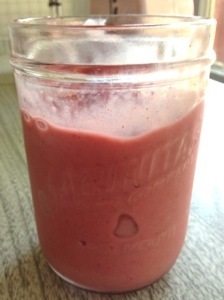 After a few recipes, I went rogue and was able to make my own DIY frosty smoothies that were actually tasty. Thanks, Kathy! Super easy! The instructions are simple. Combine and blend, with a few exceptions. I found it easy if I picked out a few smoothies I wanted to try, then bought some frozen and fresh ingredients for a week’s worth of smoothies. Buy a bunch of bananas, cut them up, and freeze them. Most of the smoothies call for frozen banana slices. By prepping a bunch of bananas at a time, it took no time to whip up my favorites. ← When People Tell You that You Can’t Become a Writer, Read This. Realize You Can Do It. Then Get Back to Work.